Installing Windows 7 with Silicon Image 3112 RAID Controller – where to get the right driver? Windows 7 is definitely an awesome piece of software. Sounds funny when such words come out from me, Apple hardware and software fan. 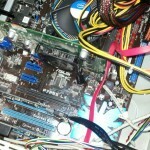 Yet, this post is about troubles i had while setting up Windows 7 on a client PC with Silicon Image 3112 RAID Controller. Despite Windows 7 being aware about most of the drivers for most of controllers it did not recognize my RAID card when booting from the installation DVD. After googling around and looking for the right driver on numerous forums, i found two places: an official Microsoft forum post and Station-Drivers.COM page. Some of the posters suggested that you need to update your controller’s BIOS in order for the driver to work, however in my case it was not necessary. After a few tests with different versions of drivers from Station-Drivers.COM i finally succeeded. I have the zip file hosted on my blog, so in case you looking it’s here – download Sil3112 Windows7 driver and unzip onto a USB stick drive. Then plug it into computer where you are installing Windows 7 and when installation screen will ask you to select the drive you are setting it up on, choose “Load a driver”, select the USB stick from the list of the devices and you are good to go. You rock. This driver was probably hard to find two years ago, thank you so much for hosting it. My old school Raptors are together again. Worked great, saved me an hour of hunting. Thanks! yeah man, when i have a son i will put your name to him! thanks a lot!!! Thanx! Going through some old MBs to see if I can find one for a basic test bed.